Lydd is a town and electoral ward in Kent, England, lying on the Romney Marsh. It is one of the larger settlements on the marsh, and the most southerly town in Kent. Lydd reached the height of its prosperity during the 13th century, when it was a corporate member of the Cinque Ports, a "limb" of Romney. Actually located on Denge Marsh, Lydd was one of the first sandy islands to form as the bay evolved into what is now called the Romney Marsh. The name Hlyda, which derives from the Latin word for "shore", was found in a Saxon charter dating from the 8th century. 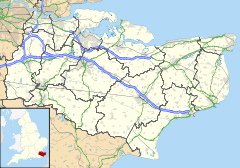 The parish of Lydd comprises the town of Lydd, Dungeness, Lydd-on-Sea and parts of Greatstone. Notable buildings in Lydd include the Gordon house longhall, a guildhall and a mediaeval courthouse. Chamberlains and churchwardens accounts of the 15th century survive alongside the town charters. Lydd developed as a settlement during the Romano-British period on a shingle island when the coast at the time cut off Lydd from the mainland. The settlement continued into the Saxon period, with the Saxon church using Roman materials as part of its early construction. The town reached the height of its prosperity during the 13th century, when it was a corporate member of the Cinque Ports, a "limb" of Romney. As with much of the marsh, the town was a base for smuggling in the 18th and 19th centuries. Before the First World War Lydd became an important artillery practice camp. Experiments with high explosives carried out on the shingle wastes around 1888 led to the invention of the explosive Lyddite. Lydd was at one time a garrison town and the area is still an important training ground for the armed forces, at one time having an extensive narrow gauge railway network. In September 1940, one of four young Dutch men who had landed on the coast between Hythe and Dungeness in a rowing boat was arrested for spying shortly after drinking at the Rising Sun pub. Three of the four were hanged at Pentonville Prison. On 21 October, a Dornier was forced to land at the Lydd aerodrome, short of fuel, the pilot having been confused in his bearings whilst attempting to return to France, by the use of recently invented equipment devised to interrupt the homing beams sent from Germany to guide such planes. The Dornier was the first example of this new type of bomber to fall into the hands of British Intelligence. Lydd's wartime airfield was situated north of the town – only one Nissen hut now remains. A Wellington bomber had the misfortune to crash-land on 26 June on returning from a 1,500-plane attack on Bremen. The 19-year-old pilot managed to get the plane down safely near Lydd, and the crew survived the crash, but were not certain they were in England until rescuers came to their assistance. On 27 November, a train came under attack by two Focke-Wulf 190s. The train, hauled by Southern Railway D3 number 2365 which was just departing from Lydd Town railway station, had its boiler hit. The resulting jet of high pressure steam from the engine hit the plane, causing it to crash-land nearby; the pilot was found dead, but no railway staff or passengers were injured. The two planes had been heading over the coast after a raid on Ashford and attacking a minesweeper off Dover. All Saints' Church, also known as Lydd Church or The Cathedral on the Marsh, belongs to the Diocese of Canterbury. All Saints is the longest parish church in Kent at 199 feet (61 m), and also has one of the tallest towers in the county at 132 feet (40 m). The church is thought to incorporate a small Romano-British basilica possibly built in the 5th century, though most of the current fabric is medieval. It was associated with local fraternities or Guilds in the 15th century and could seat 1,000 people at a time. Severely damaged by World War II bombing, the church was subsequently restored and became a Grade I listed building in 1950. Lydd church with its tall tower was a major link in the chain of trigonometric measuring points for the Anglo-French Survey (1784–1790) linking the Royal Greenwich Observatory and the Paris Observatory. This eighteenth-century survey was led by General William Roy, and included a secondary base-line for checking purposes on Romney Marsh, between Ruckinge and Dymchurch. The primary base-line was on Hounslow Heath. The parish encompasses four electricity industry sites: Dungeness A & B Nuclear Power Stations, a substation of the National Grid, and a former static inverter plant used by the HVDC Cross-Channel between 1961 and 1984. Dungeness A has now ceased electricity production and is in the process of being de-commissioned. There are several sewers in the area, including Dengemarsh Sewer, Jury's Gut Sewer, and Scotney Petty Sewer. Lydd has two football clubs, Lydd Town established in 1885, and Lydd United established in 2009. Lydd Town play in the Kent Invicta Football League. United play in the Ashford and District Saturday League. Lydd also has a kart/minimoto track called Lydd International Kart Circuit. Lydd Cricket Club is based at the Banks, Dennes Lane. Both the ground and pavilion belong to the Town Council. Lydd Golf Club and Driving Range is on the Romney Road in Lydd. Apart from the 18-hole championship quality course, it boasts an 18-bay covered driving range, a 6-hole par 3 course, two chipping greens and a putting green. Lydd has two paid for newspapers, the Romney Marsh Herald (published by Kent Regional News and Media), and the Kentish Express (published by the KM Group. Free newspapers for the town include the Folkestone and Hythe Extra. There is also a fortnightly publication called The Looker published by the owners of RMFM, and an alternate publication called The Marsh Mail edited by Amanda Heath, however this only lasted a couple of editions. The Looker now has the largest curculation of 15,000 copies every two weeks. The local radio station for Lydd is KMFM Shepway and White Cliffs Country. Lydd is also served by the county-wide stations Heart, Gold and BBC Radio Kent, and has good coverage of stations based in East Sussex. Lydd Club Day is the annual local carnival held on the Rype – the largest on Romney Marsh, held on the third Saturday of June. It was established in 1868. Apart from a brief cessation during the war years, it has taken place annually ever since. The day features a funfair, boot fair in the morning, stalls and children's dressing up in the afternoon and floats in the evening. The evening ends with a firework display and the lit up funfair, as well as the annual crowning of the Queen Elect. On the Friday evening before Lydd Club Day, there is a long-standing tradition of "Test Night" when the funfair opens, at reduced prices for the evening. In recent years, "Pirate Friday" has begun. Most Lydd residents have no real understanding of what this event is supposed to entail, other than Lydd's pub frequenters dressing in pirate outfits. The event was created in 2006 by local residents Jason James, David Usher and Ian Parrot and friends in the Royal Mail. The now annual event has proved so popular it has been adopted by every pub in Lydd. Since 2011, there has been an entrant in the evening parade from residents who have participated in Pirate Friday. A railway line from Dungeness to Appledore runs through the town with Lydd Town Railway station being the principal station on the line. This operated December 1881 to 1967, when it was closed to passenger traffic although it remains in use for freight traffic. There has been discussion to reopen the line and the station is protected against development prejudicial to the reopening of the line from Appledore to the public through inclusion in the Folkestone and Hythe district Local Plan. One terminus of the Romney, Hythe and Dymchurch Railway is at Lydd. Lydd Airport, originally known as Ferryfield, and now also known as London Ashford Airport, was the first airport to be constructed in Britain after the Second World War. David Denne, of the family of that name from Lydd, was an English first-class cricketer, Deputy Lieutenant and Justice of the Peace for the County of Kent, and formerly Captain of the East Kent and Cinque Ports Yeomanry, and Bailiff of the town Corporation 23 times. He died in December 1861 aged 63. Samuel Fisher, a noted lecturer at Lydd, who then resigned his lectureship to become Baptist and Quaker, was a noted religious controversialist and is known especially for his book Rusticus ad Academicos: The Rusticks Alarm to the Rabbies that anticipated in important ways some principles of modern biblical criticism. Fisher lived in Lydd from 1632 until 1660, and died in 1665. Graham Rye, author, editor and publisher of 007 MAGAZINE and renowned authority on the subject of the James Bond films. Owner of the world's most comprehensive archive on the subject, lives in the town. Rye has connections with cast and production staff from the films and is a consultant to the media. ^ "Ward and Town population 2011". Retrieved 5 October 2015. ^ Alan Everitt (1985). LANDSCAPE & COMMUNITY IN ENGLAND. Continuum International Publishing Group. p. 18. Retrieved 14 February 2013. ^ John Hines (1 September 2003). The Anglo-Saxons from the Migration Period to the Eighth Century. Boydell Press. p. 389. Retrieved 14 February 2013. ^ "The Cinque Ports Limbs". Archived from the original on 29 May 2008. Retrieved 17 August 2008. ^ Joshua Levine (4 April 2011). Operation Fortitude: The True Story of the Key Spy Operation of WWII That Saved D-Day. HarperCollins UK. pp. 62–63. Retrieved 14 February 2013. ^ "Hanged, the Nazi spies who came to Britain in a pair of rowing boats | Mail Online". dailymail.co.uk. 1 May 2007. Retrieved 14 February 2013. ^ "HOLDING THE WEST". asisbiz.com. Retrieved 3 April 2018. ^ Hillier, Caroline (1980). The bulwark shore: Thanet and the Cinque ports. E. Methuen. p. 236. ISBN 978-0-413-39580-1. Retrieved 14 October 2012. ^ a b "Church of All Saints, Lydd". British Listed Buildings. Retrieved 14 October 2012. ^ "The Medieval Churches of Romney Marsh". Romney Marsh Heritage Trail. Retrieved 15 October 2012. ^ Wilson, David Mackenzie. The Archaeology of Anglo-Saxon England. Routledge. p. 166. ISBN 9780416150902. ^ "Lydd Town FC". Lydd Town Football Club. Retrieved 26 August 2015. ^ "Lydd United FC". clubwebsite. Retrieved 26 August 2015. ^ "Lydd Kart Circuit". Lydd Kart. Retrieved 26 August 2015. ^ "Lydd CC". Lydd Play Cricket. Retrieved 26 August 2015. ^ "Lydd Golf Club and Driving Range". Lydd Golf Club. Retrieved 26 August 2015. ^ "Romney Marsh Herald". /journalisted.com. Archived from the original on 4 April 2018. Retrieved 3 April 2018. ^ "The Looker". thelooker.co.uk. Retrieved 3 April 2018. ^ "Club Day to return, say organisers". Folkestone Herald. Archived from the original on 5 May 2013. Retrieved 28 September 2015. ^ "London Ashford Airport". Retrieved 17 August 2008. ^ Bellinger, Terreena. "MONUMENT AND TRANSCRIPTION LIST: LYDD CHURCH, 2009" (pdf). rmrt.org.uk. Retrieved 3 April 2018. ^ "Lydd, England Köppen Climate Classification (Weatherbase)". Weatherbase. Retrieved 28 September 2015. ^ "Weatherbase.com". Weatherbase. 2013. Retrieved on 9 July 2013.